The deep partisan divide that pervades much of American life extends to views about the police, according to a Pew Research Center survey of U.S. adults. Republicans and Democrats have vastly different opinions about how well police do their jobs and the realities of policing today – views that are likely linked to clear partisan splits on opinions of the Black Lives Matter movement and highly publicized fatal encounters between blacks and police in recent years. About three-quarters of Republicans say that police around the country are doing an excellent or good job when it comes to treating racial and ethnic groups equally, using the right amount of force for each situation and holding officers accountable when misconduct occurs. Only about a quarter of Democrats agree. 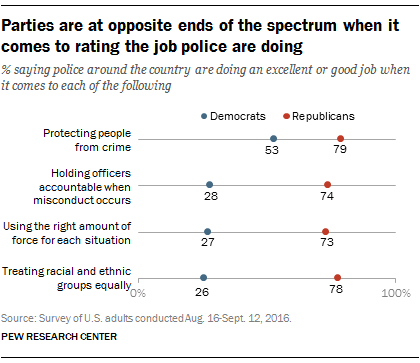 When it comes to protecting people from crime, 79% of Republicans say police are doing an excellent or good job, compared with 53% of Democrats. Independents fall between Republicans and Democrats on these questions. Partisans also differ in the role they see police performing. 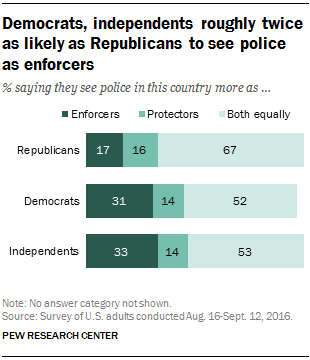 For example, about a third of Democrats (31%) and independents (33%) say they see police in this country more as enforcers than protectors, roughly double the share of Republicans who say this (17%). Republicans, for their part, are more likely to say police in this country fill both of these roles equally (67%) compared with Democrats (52%) and independents (53%). Partisan differences also are evident on questions about the realities of policing today. For example, while majorities of each party say that being a police officer is more dangerous now than it was five years ago, Republicans (87%) are more likely than Democrats (62%) and independents (69%) to say this. Overall, U.S. adults give higher ratings to police in their community than they do to police nationwide, and the partisan gap in views of local police is narrower. For example, about half of Democrats (53%) say police in their community are doing an excellent or good job treating racial and ethnic groups equally, compared with 69% of independents and 85% of Republicans. Even so, Republicans are almost twice as likely as Democrats to say they have a lot of confidence in their community’s police department (51% vs. 29%). Still, the parties largely are in agreement when it comes to the size of their local police force. A plurality of each group says they would prefer to see no change in the size of the police presence in their local area, though Republicans (59%) and independents (60%) are somewhat more likely to say this than Democrats (53%). Meanwhile, Republicans (37%) and Democrats (36%) are slightly more likely than independents (30%) to say they would prefer to see a larger presence than currently exists, and small shares of Democrats (8%), independents (10%) and especially Republicans (2%) say they would prefer a smaller police presence in their local area.